This recipe is for a Scone with a light and spongy, almost bread like texture. What makes these Scones extra special is that we add a little pure maple syrup to the batter which gives a sweet nutty flavor to the Scones. It also pairs so well with the dark chocolate chips and chopped pecans. Maple syrup is a reddish-brown aromatic liquid that has a distinctive rich sweet nutty flavor. It is produced from the sap of maple trees grown in Canada and the Northeast United States. In early spring (called 'sugar season') when the nights are still cold but the days are warm enough that the sap begins to run, a small hole is made in the maple tree and a spout is then driven in from where a bucket is hung to collect the sap. Once collected, the sap is boiled down until most of the water has evaporated and the sap has become thick and syrupy. The whole process is very labor intensive and it takes anywhere from 20, and up to 50, gallons of sap to produce one gallon of maple syrup. The syrup is graded by its color and flavor i.e. the darker the color, the stronger the flavor. Another ingredient used in these scones is buttermilk. Buttermilk has a thick and creamy texture with a rich tangy buttery taste that gives scones a bread-like texture. Buttermilk is now commercially made by adding a bacteria to whole, skim, or low fat milk. You can make a good substitute by stirring 1 tablespoon of white distilled vinegar, cider vinegar, or lemon juice into 1 cup (240 ml/grams) of milk. Let stand at room temperature about 10 minutes before using. 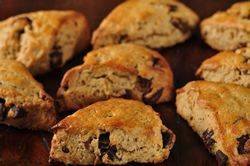 Pecan Chocolate Scones: Preheat your oven to 400 degrees F (200 degrees C). Line a baking sheet with parchment paper. In a large bowl, whisk together the flour, sugar, baking powder, baking soda, and salt. Cut the butter into small pieces and blend into the flour mixture with a pastry blender or two knives. The mixture should look like coarse crumbs. Stir in the chopped nuts and chocolate chips. In a small measuring cup combine the buttermilk with the maple syrup and then add to the flour mixture, stirring just until the dough comes together. Do not over mix. Transfer to a lightly floured surface and knead the dough gently four or five times and then pat the dough into a circle that is about 7 inches (18 cm) round. Cut this circle in half, then cut each half into 4 pie-shaped wedges (triangles). You will have 8 scones altogether. Place the scones on the baking sheet. Brush the tops of the scones with cream. Bake for about 18 - 20 minutes or until golden brown and a toothpick inserted in the middle comes out clean. Transfer to a wire rack to cool. Best eaten the day they are made but can be covered and stored at room temperature for a few days. Can also be frozen.